Distribution: Europe, Asia, Northwestern Africa, introduced to U.S. Uses: increases heart contractility and is an antiarrhythmic, traditionally, not used today because it has a narrow safe dosage range. Activity: digitoxin or digoxin inhibits sodium/potassium ATPase, which increases intracellular sodium, decreases the Na/Ca pump and thereby increases cytoplasmic calcium. It also affects the parasympathetic nervous system. Foxglove (Digitalis) is a plant with beautiful bell-like purple and white flowers that lots of people grow right here in Seattle. Amazingly, this lovely plant contains two chemicals that are extremely potent heart drugs. Although foxglove was used for a variety of medical problems for thousands of years, it wasn’t until the 20th century that scientists finally understood the link between foxglove and heart failure. Soon thereafter, chemicals derived from the plant were developed into prescription drugs. Foxglove contains the chemicals digitoxin and digoxin. These chemicals make the heart contract stronger which allows blood to flow through the heart more efficiently and give the heart more time to rest between contractions. These chemicals can also correct abnormal heart beats. These chemicals are really valuable treatments for heart problems, but they are extremely powerful. Taking too high a dose can cause severe neurological side effects such as dizziness, exhaustion, and hallucinations. A high dose can also cause cardiac side effects including abnormal heart rhythms. In high amounts, these chemicals can be deadly. 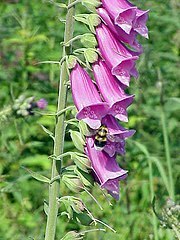 Foxglove is a poisonous plant and should never be eaten.